April 27, 2017 – Since receiving her diagnosis in July, Susan Miller hasn’t let breast cancer keep her from smiling, and she didn’t let a recent hip replacement surgery keep her from attending Georgetown Lombardi’s Women & Wine fundraiser dinner on April 24, where she was honored with the Lombardi Spirit of Life Award. From its debut 12 years ago with about 100 women in a crowded room at The Palm restaurant, Women & Wine has grown significantly. 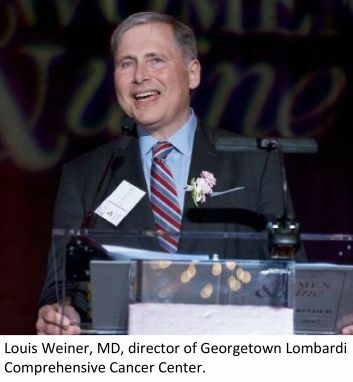 Featuring a cocktail reception, silent auction and award presentation, the women-only event has raised $1.8 million since its inception for the Nina Hyde Center for Breast Cancer Research at Georgetown Lombardi Comprehensive Cancer Center. 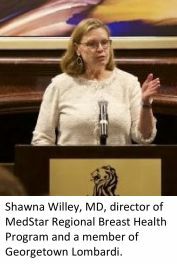 Shawna Willey, MD, director of MedStar Regional Breast Health Program and a member of Georgetown Lombardi and Claudine Isaacs, MD, co-director of the breast cancer program at Georgetown Lombardi, kicked off Women & Wine with a briefing on the state of breast cancer research. In addition to basic science research on early stage breast cancer, funds raised from Women & Wine have supported research on the biological impact of social isolation and its effect on patients, why some patients discontinue hormonal therapy and how to encourage patients to make better use of genetic testing. Susan Miller was honored at Women & Wine with the inaugural Lombardi Spirit of Life Award, which is given to a cancer survivor who exemplifies character and leadership in the community while promoting cancer research and awareness. After she was diagnosed with stage 3 triple-negative breast cancer in July, Miller, a mother of four children under age 8 with no family history of breast cancer, has faced a number of challenges, some of which she mentioned in her award acceptance speech.